Four recipients were honored at The Oklahoma Chapter of WTS International’s inaugural Scholarship and Awards Gala. From L to R: Commissioner Cindy Bobbitt, Crystal Baird, Mike Patterson (on behalf of ODOT), Susan Davis and Tim Gatz (keynote). Oklahoma City — The Oklahoma Chapter of WTS International honored four recipients during its inaugural Scholarship and Awards Gala at the Oklahoma History Center. 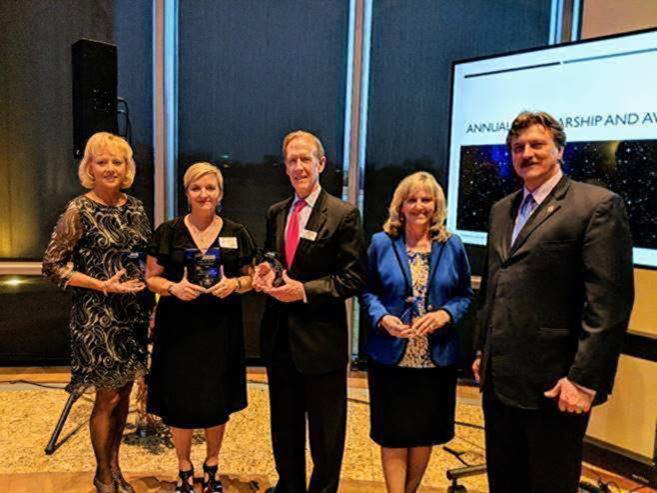 Crystal Baird was recognized as the organization’s first scholarship recipient, while Commissioner Cindy Bobbitt, Chapter President Susan Davis, P.E., and the Oklahoma Department of Transportation (ODOT) were also honored. The awards program recognizes individuals and organizations that support the advancement of women in the transportation industry and that promote the importance of WTS in the business community. Sharon D. Banks Scholarship Award — Crystal Baird received this scholarship for her accomplishments while pursuing a degree in Civil Engineering at the University of Oklahoma. Baird is a non-traditional student and a single mother who has worked in the transportation industry for over two years with a goal of earning a professional engineer license. Employer of the Year — Oklahoma Department of Transportation (ODOT) earned this award for continuously recruiting, retaining and advancing women in a variety of roles, including key leadership positions statewide. Women make up 20 percent of ODOT’s total work force of 2,277 employees. Woman of the Year — Commissioner Cindy Bobbitt was recognized for serving as an outstanding role model in the transportation industry, contributing to the advancement of women and minorities in the transportation field and advancing the reputation and credibility of women in transportation. Commissioner Bobbitt has been instrumental in lobbying state legislation to secure extra funds for county roads and bridges. She serves on the Grant County Board of Commissioners and is a member of the board of the National Association of Counties. Member of the Year — Susan Davis, P.E., was honored for her extraordinary contributions to the successful creation of the WTS Oklahoma Chapter and her dedication to building and expanding the Chapter’s programs. Davis is a project manager and civil engineer with Triad Design Group and has more than three decades of experience in highway design and project management. The keynote speaker of the sold-out awards dinner and program was Tim Gatz, executive director of the Oklahoma Turnpike Authority. Gatz discussed the future of the Driving Forward plan, Oklahoma’s turnpike expansion program. He also recognized all of the women involved in various projects for the Driving Forward initiative, applauding them for their service to the transportation industry. The WTS Oklahoma Chapter (https://www.wtsinternational.org/Oklahoma) is one of 79 chapters of WTS International, a network of 40,000 transportation professionals with members across the United States, Canada and the United Kingdom. WTS International was founded in 1977 by a group of pioneering women in transportation who realized that women’s careers would benefit from professional development, encouragement and recognition to support their advancement in transportation professions.